OLFA Blades HB-5B Model 5008 25mm Are Extra Heavy Duty Snap-off Replacement Blades. 5 blades per pack. CLICK ON IMAGE AND SCROLL DOWN TO RELATED PRODUCTS FOR A LIST OF CUTTERS OR KNIVES THESE BLADES WILL FIT. OLFA Blades HB-20B Model 9061 25mm Are Extra Heavy Duty Snap-off Replacement Blades. 20 blades per pack. CLICK ON IMAGE AND SCROLL DOWN TO RELATED PRODUCTS FOR A LIST OF CUTTERS OR KNIVES THESE BLADES WILL FIT. Olfa Blades HH-12B Model 1124930 25mm. Hook Blades. 4 Segments Per Strip. CLICK ON IMAGE AND SCROLL DOWN TO RELATED PRODUCTS FOR A LIST OF REPLACEMENT BLADES. OLFA Blades UltraMax HBB-20B Model 1082209 25mm Are Extra Heavy Duty Snap-off Replacement Blades. 20 blades per pack. CLICK ON IMAGE AND SCROLL DOWN TO RELATED PRODUCTS FOR A LIST OF CUTTERS OR KNIVES THESE BLADES WILL FIT. 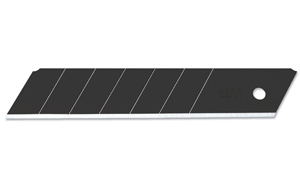 OLFA Blades UltraMax HBB-5B Model 1125383 25mm Are Extra Heavy Duty Snap-off Replacement Blades. 5 blades per pack. CLICK ON IMAGE AND SCROLL DOWN TO RELATED PRODUCTS FOR A LIST OF CUTTERS OR KNIVES THESE BLADES WILL FIT. 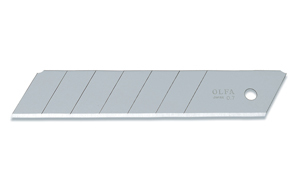 OLFA Pull-Saw Blade HSWB-1/1B 1105914 25mm. Crafted Of Sturdy Carbon Tool Steel. CLICK ON IMAGE AND SCROLL DOWN TO RELATED PRODUCTS FOR A LIST OF REPLACEMENT BLADES.